Edgar D. Mitchell explored the moon’s hilly Fra Mauro region with Alan B. Shepard during the 1971 Apollo 14 mission. Mitchell was born September 17, 1930, in Hereford, Texas. He received a Bachelor of Science in industrial management from Carnegie Institute of Technology in 1952; a Bachelor of Science in aeronautical engineering from the U.S. Naval Postgraduate School in 1961, and a Doctorate of Science in aeronautics/astronautics from the Massachusetts Institute of Technology in 1964. He entered the Navy in 1952 and was commissioned an ensign a year later. He completed flight training in July 1954 and was assigned to Patrol Squadron 29 deployed to Okinawa. Assigned to Heavy Attack Squadron Two in 1957, he flew off the aircraft carriers USS Bon Homme Richard and USS Ticonderoga. He later served as a research pilot with Air Development Squadron Five and as chief of Project Management Division of the Navy Field Office for the Manned Orbiting Laboratory project. Mitchell was selected as a NASA astronaut in April 1966 after graduating first in his class from the Air Force Aerospace Research Pilot School, where he was both a student and an instructor. His only space assignment was a Lunar Module pilot for Apollo 14, a 10-day lunar exploration flight that lifted off January 31, 1971. His crewmates were Commander Alan Shepard and Command Module pilot Stuart Roosa. On February 5, Shepard and Mitchell landed their Lunar Module “Antares” in the Fra Mauro highlands while Roosa orbited overhead in “Kitty Hawk.” During 33 hours on the surface, Shepard and Mitchell made two outside excursions during which they set up a nuclear-powered science station, collected 92 pounds of moon rocks and gathered deep-down soil samples by driving core tubes into the surface. The blastoff from the moon was routine and they linked up with Roosa for a safe trip back to Earth. Mitchell long had an interest in extra-sensory perception and during the moon flight he conducted ESP experiments with a friend in Chicago. Following the Apollo program, he retired from NASA and from the Navy as a captain and founded the Institute of Noetic Sciences in an effort to integrate various scientific disciplines into the study of human consciousness. He has written several books, including the 1996 “The Way of the Explorers,” which addresses the latest research in this field. Mitchell serves on the Board of Directors of the Astronaut Scholarship Foundation. He passed away at age of 85 on February 4, 2016. 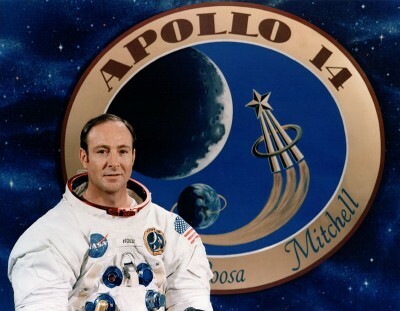 Edgar Mitchell was inducted into the U.S. Astronaut Hall of Fame on October 4, 1997.